For The Fundamentals of Drawing Part 1 at V & A. Where and when to meet. Please try not to be late but if you are please call Rosa on 07883 068 325 to be directed to where we are. You need to bring your own sketchbook but all other materials including stools will be provided by us, I recommend that you invest in the largest sketch book you can, preferably A3, hardbacked and ringbound so you can fold it over and rest it comfortably on your knee. You can order one from Amazon below. Stools are provided by the V&A. I provide pencils, rubbers, sharpeners, pastels and water pens. If you would like to bring/use any other materials please feel free to do so but bear in mind that only dry materials are allowed within the V&A, no paints. The V & A Museum can be a bit drafty so I suggest that you bring a couple of comfortable layers that won’t restrict you while you are drawing and its a good idea to bring a bottle of water to drink during the drawing sessions as no other drinks are allowed in the galleries where we draw. Lunch takes place at L’Opera restaurant on Brompton Rd between 1.15pm and 2.15pm. Lunch is not included in the ticket price. The Fundamentals of Drawing Part 2 at Tate Britain. The nearest tube is Pimlico. Please don’t get confused with Tate Modern! We always meet on a bench in the corner of the Sacler Octagon at 10.15 this is just about in the middle of the Museum but is easy to get to from the front entrance- just walk in and keep walking down the centre of the museum until you get to it. 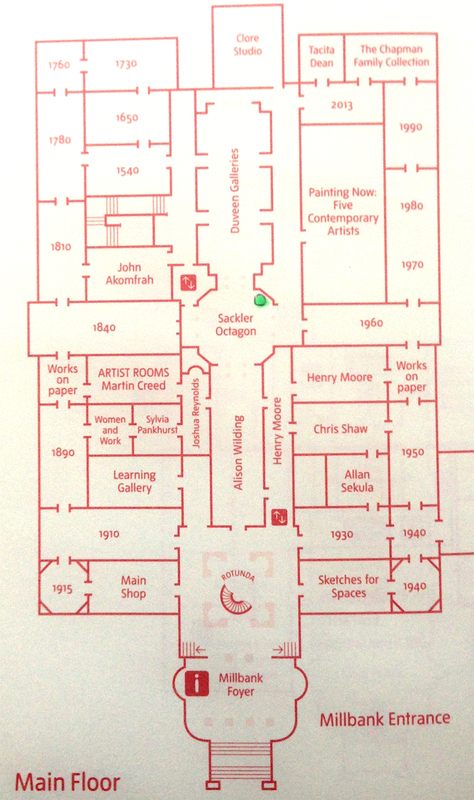 See map below- our meeting place is the green dot. You need to bring your own sketchbook but all other materials will be provided by us. As usual we recommend an A3, hardbacked and ring-bound Sketchbook where possible. The Museum can be a bit drafty so I suggest that you bring a couple of comfortable layers that won’t restrict you while you are drawing and it’s a good idea to bring a bottle of water to drink during the drawing classes as no other drinks are allowed in the galleries where we draw. There is a break for lunch between 1.15 and 2.15.